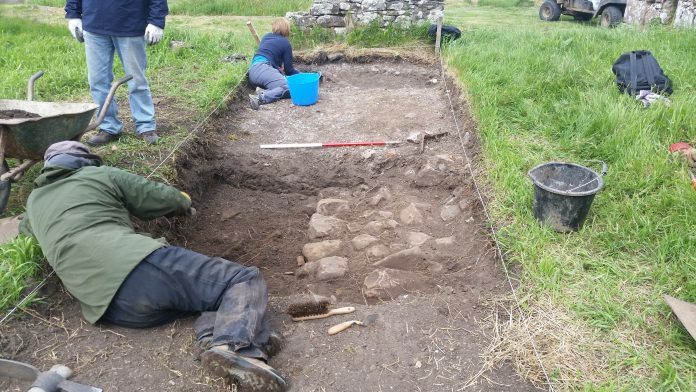 We have now made two visits to Threipmuir Farmstead in the Pentland Hills with Robin Murdoch to carry out a trial excavation at the site of a horse-driven gin which would have powered a threshing machine by a series of gears and shafts. After hacking through some extremely resilient nettle roots we found a gravelly layer at the East end of the trench with much domestic detritus including cutlery, glass, intact bottles (one dated 1931) 18/19th century pottery and metal. A central sondage revealed many more domestic finds including some footware and a fragments of a possible cast iron bucket or pan lying on a very uneven laid surface of largeish stones.